SCD realizes that you have most likely seen this model or video before, especially considering it has been viewed 375,000 times on YouTube. We have viewed it at least a dozen times, but it never fails to amaze. If you have never seen this video or read the story behind it, prepare to be astonished by the quality of this Ferrari 312 PB scale model. It has to been seen and heard to be believed. There are few if any models in the world to rival the Ferrari 312PB built by Pierre Scerri of Avignon, France. This 1:3 scale marvel is the real thing in every sense, from its operating 12-cylinder engine to the exact scale operating Ferrari gauges which are calibrated precisely to indicate rpm, oil pressure, water temperature and oil temperature. It took Pierre 15 years and more than 20,000 hours to build this car. He learned to make glass so he could make the exact pattern lens for the operating headlights. He learned to make rubber so he could mold his own tires. His computer mainframe design background with the French telecommunications system allowed him to duplicate the Ferrari electronics system in exact miniature. 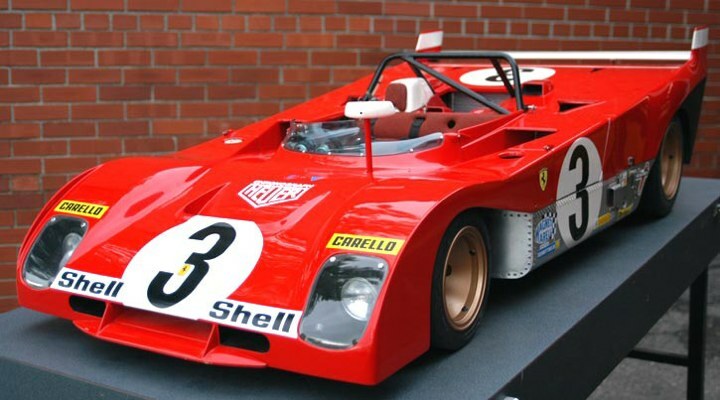 It also provided him with the understanding needed to make a 1/3 scale operating fuel injection system identical to that in the full-size Ferrari. Perhaps the toughest aspect of the car was the gearbox, for which Ferrari supplied drawings. While Pierre had an understanding of the object to be built, he lacked the very expensive specialized equipment required to build high-tolerance gears and synchros. Colleti, the builder of the full-size car’s gearbox ended up building the model’s gearbox. There is no sign of deviation from the real car in terms of replication. The spark plugs are miniatures, the radiators were hand-built to the exact same core design as the real ones. Even the water reservoir fill cap is a Fiat radiator cap made exactly the same way as the real one and pressure tested. The suspension is exact and the hydraulically controlled brakes from the brake pedal have quick-change brake pads just as on the real car. If you were 1:3 scale, you would open the door of the car, get in, fasten your seat belt as on the full-size car, take you Ferrari key (engraved identically to the real key) and put it into the ignition. You would flip the toggle switch for the fuel pumps, and with this you would hear the fuel-injection system come to life, powered by a real scale battery built by Pierre. A crew member would stick the hand-held scale starter into the rear transaxle housing and as the engine turned over you would flip the ignition toggle switch and the 12-cylinder engine would come to life with a sound you’d never forget. This 12-cylinder engine just isn’t any 12-cylinder engine, it is a 1:3 scale Ferrari 12-cylinder engine with the same beautiful sound. It took Pierre six months of running the engine on his own dynamometer to tune the header pipes so they would give off the same sound value as he had recorded from the engine of the real car. Once Pierre had the engine bolted together for the first time, it started on the very first try and, since then, has logged more than fifty hours of running time with no failures or refusals to start (It’s probably more reliable than the real engine). In short, this model car is so incredible that one has a very difficult time focusing on the fact that it is a model and not a full-size car. Pierre has begun work on a 1:3 scale Ferrari P4.